Perhaps the brain has the equivalent of a laminar flow region (like water from a tap), where all the ordered information and processes are well catalogued and indexed. This is our acquired and inherited knowledge, conscious and sub conscious. Outside this region there is the equivalent of chaos, masses of unstructured data and half-formed thoughts: a swirling mass of unstructured and unintelligible information derived from the incalculable quantities of sensory input the brian receives every second: a region of wild turbulence and disorder. Chaos. We are only vaguely aware of this chaotic region. Here lurk the demons of madness. Yet isn't genius on the edge of madness? What is actually happening at the boundary - at the edge of chaos? If the analogy of our example of the water flowing from the tap holds true, than at the edge of chaos there is an erratic stream of tiny whorls of disordered thought which comes spinning out of chaos to penetrate the lamina region. Those thoughts come from the adventurer and free-thinker John Ridgway. They appeared here previously in a very early post about Gesualdo and Nick Drake and I was reminded of them last night listening to a recording of Bohuslav Martinů's String Quartet No. 6. How true it is that for the majority of our brief time on earth we are content to exist in the comfort of the laminar flow region. It is our inbuilt craving for the secure and predictable that so much contemporary culture exploits while, by contrast, Martinů's Quartets build on those tiny whorls of creative thought that come spinning out of the blue at the edge of chaos. Martinů's Symphonies are gaining acceptance but his Quartets are still neglected - presumably because their exploration of the outer reaches of tonality is alien to a digital age in which, as John Ridgway reminds us, all information must be neatly catalogued and indexed. 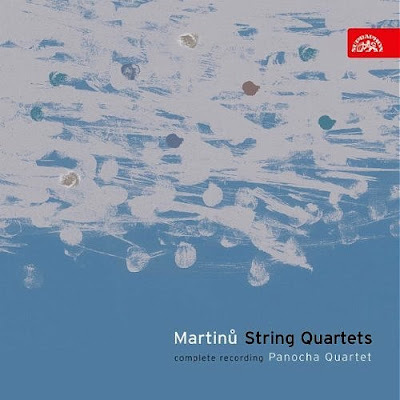 I was listening to the commendable account by the Panocha Quartet account of the Sixth Quartet from their complete cycle of Martinů's Quartets on Supraphon; the artwork above exhibits remarkable synchronicity with the opening quote. Naxos has alternative recordings of the Quartets which I am not familiar with. More on music from beyond the laminar flow region here. Header quote is from the out of print We Sailed Away by the Ridgway Family ISBN-13: 978-0316877091. Any copyrighted material on these pages is included as "fair use", for the purpose of study, review or critical analysis only, and will be removed at the request of copyright owner(s). Report broken links, missing images and errors to - overgrownpath at hotmail dot co dot uk Also on Facebook and Twitter. Great blog with terrific writing on music. If Norwich-based surely wearing the mantle of the bloggers in sheer duration and quality. I wrote a little on Martinu's symphonies late last month, hence finding you. Like you i cannot understand why Martinu is not more known and liked than gloomy Shostakovich. I agree the 6 symphonies really are the crowning glory of his genius and exemplary of 20th century sensibility in music. Think i may have to make do with the much cheaper costing Naxos recordings of the quartets.